Asclera, or Polidocanol, is an injectable agent used to help treat varicose veins (1 to 3 mm in diameter) and spider veins (less than 1 mm in diameter). It is currently being used in Europe and elsewhere, and received FDA approval for use in the United States in 2010. Asclera, like other pharmaceutical sclerosing agents, irritates the interior walls of the vein, causing them to constrict and close. This prevents the flow of blood through the affected vein and can effectively eliminate the swelling, bulging, discomfort and discoloration which may be caused by small varicose veins or spider veins. What areas of the body does Asclera treat? Injection sclerotherapy is a primary treatment option for small varicose veins and spider veins. 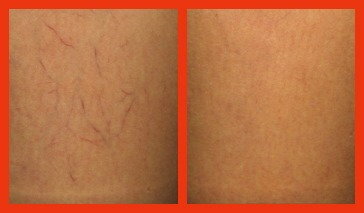 Asclera Injection is indicated for sclerotherapy of spider veins and small varicose veins in the lower extremities. Asclera (polidocanol) injection has been used Europe to safely and effectively treat spider veins and reticular veins in the legs for over 40 years. In this time, over 5 million treatments have been performed with a very high success rate. In addition, Asclera has anesthetic properties, which may make treatment more comfortable for patients. Who is a candidate for Asclera treatment? Most men and women who are experiencing varicose or spider veins are good candidates for injection sclerotherapy treatment. Patients with certain blood conditions or vascular ailments, as well as those taking specific medications may not be suitable candidates. Be sure to discuss any current medical conditions and medications with your specialist before undergoing any vein procedure. In addition, women who are pregnant are not generally considered good candidates for this or other vein sclerosing treatments. Asclera should not be used in patients with known allergies to polidocanol (lauromacrogol 400) or any of the other ingredients of Asclera. Before the procedure, your specialist will clean the treatment area and may apply a topical anesthetic to numb the injection site. For most men and women, and depending upon the number of sites being treated, the entire procedure takes about 30 to 45 minutes to perform, and is performed in an outpatient setting. For most patients, results will be evident in one to three treatments with Asclera, and can be evaluated within a few days of treatment. Some patients may require additional treatments to address stubborn veins. With any injection sclerotherapy treatment, there is always a risk of scarring or skin breakdown at the site of treatment. In addition, treatment with any sclerosing agent incurs a very small risk of infection. Be sure to discuss possible side effects or risks with your specialist before undergoing any treatment for varicose or spider veins. Asclera was approved by the FDA in 2010 for the treatment of small varicose and spider veins. Photo courtesy of Asclera®. Individual results do vary.